Jacob Eduard (Jaques) and Eduard (Eddy) van de Rhoer did not follow in their father’s track; they did not concern themselves with the cattle trade. Jacob studied law and after his study he became a solicitor in his place of birth. Especially for this his parents built an extension to their house on Stationsweg, where Jacob could practice as a lawyer. This extension can still be seen today. Since this was not a full-time job, he also taught political science at the Rijks HBS (State College) and was on the board of numerous associations in Meppel. From childhood Eduard was interested in manufacturing textile and after his schooling he worked at a factory for woollen materials in Eindhoven. During the mobilization textile became less important for him for a while, he took part in the ‘Special Training for External Security’. This army unit was situated in Westerbork of all places. And thus it happened that Eduard stayed in Hotel The Sun in Westerbork from 1939 to 1940. Sometimes he went home for the weekends; he still lived with his parents in Meppel. In Westerbork he would prepare his own meals with painstaking care because of the Jewish food rules. On the 10th of May 1940 his stay in Westerbork came to an end. What remained were the contacts which Eduard had made during his stay in Westerbork, which later proved to be very useful. Together with his section he went to Wieringermeer. There the Germans disarmed them. After a fortnight they were allowed to return home. 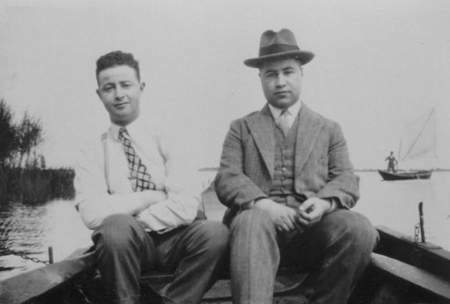 The brothers Eduard (left) and Jaques Van de Rhoer. The war was also for the sons Van de Rhoer a dreadful time. Already at the end of 1940 the Germans had forbidden Jacob to teach social science at the Rijks HBS (State College) and he was removed from a number of comity functions. A year later he was only allowed to practice his profession for Jewish clients. On 30 June 1941 all traditional political parties in the Netherlands were forbidden and that meant that all papers and documents of the secretaries of all local branches were confiscated by the police. On 1 July Major Harm Velthuijs and Sergeant Johan Merk came to see Jacob, as he was the secretary of the Liberal State Party ‘De Vrijheids bond’ (The Liberal Union). All documents concerning this party were taken by these two gentleman. This time it was not personal, but Jacob probably felt a cold shiver down his back when he saw the two policemen standing in the doorway. Around this time Eduard had to stop with his business activities. His business in ladies’ and gents’ textiles was liquidated on 1 May 1942. It did not stop there. 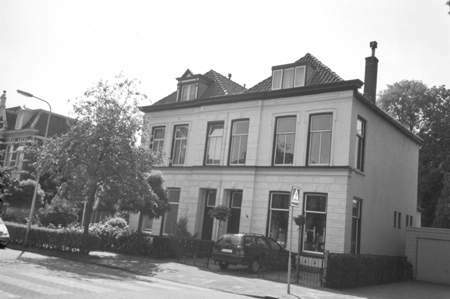 On 17 August Eduard left his parental home, together with 22 other young men from Meppel to be transported to the work camp at Linde, from where they walked to Westerbork the following morning. Straight after my arrival at Westerbork I kept myself busy with underground work. We broke into the Commander’s office and had a look at the list of transport. Sometimes we would let some of the people go into hiding in the camp. One day, it must have been around the middle of March, I was betrayed and I heard from someone of the registration that I would be transported the following day .‘What should I do’ flashed through my head. I stood up, put on a double set of underwear and socks, sneaked along the barracks and went to the house of Massier. I asked him what I should do. His first suggestion was: ‘I will talk to the guards’. That did not seem a very good plan to me and also the suggestion to crawl under the barbed wire did not appeal to me. Another solution was thought of. A box of apples was made ready and that Tuesday morning I walked with the box of apples on my bicycle along the guards and out of the gate. The guards stopped me and asked for whom it was needed. ‘It’s for the Heidelager’, an outside camp close to Westerbork, ‘Yesterday they forgot to deliver the apples there and I want to remedy this by delivering them to the kitchen’. The soldiers looked at me in disbelief and sent me back. ‘Your responsibility’ I said, ‘if it creates problems, you are responsible’. That seemed to help for they were prepared to let me go through. Once I was out of sight, I threw the apples into a ditch and speeded off on my bicycle along all sorts of small lanes to Westerbork. When I arrived it was dawn and I was hidden in the Groene Kruis(Green Cross) building The district nurse was given the day off. In the evening, heavily disguised, I took the train to Meppel. Part of my disguise were very strong glasses; so strong that I could hardly find the door handle of the train. Luckily I stepped into the right carriage so that I did not have to walk far on the platform in Meppel. From there it was a dangerous walk (I had no papers!) to the house where my brother and my fiancée were hiding. They did not even recognise me! 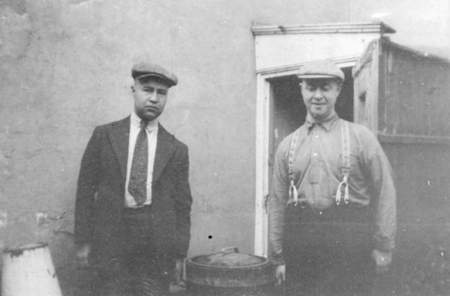 The brothers Eduard and Jaques Van de Rhoer during their period in hiding on Zuideinde. Earlier, I had already helped my brother Jaques to escape from the camp. Jaques was hidden by me in between all sorts of empty vegetable crates in a lorry that drove from Westerbork to Meppel. As a kitchen help I was taking in supplies and deliveries of vegetables. Ter Bruggen, the owner of this lorry, was a member of the NSB (collaborators) and supplier of vegetables for the camp. The driver of the lorry, Bouwman, was a dare- devil; he thought this would be a good opportunity to transport Jaques from Westerbork to Meppel. Jaques was an absent- minded professor and did everything possible to let the so-called ‘kidnapping’ fail. That morning he stood in his best clothes with his handbag, ready to leave, which of course was quite conspicuous. Nearly everything went wrong. In Meppel the lorry drove into the garage of Ter Bruggen and the boss immediately came to ask if anything exceptional had happened. The answer was ‘No’. The owner of the lorry disappeared, and my brother fled in a hurry to his place of hiding, which had already been prepared. After the escape the police tried to find Eduard and an official escape warrant was issued to search for him. 17/18 May: Sergeant-Major De Jong of Camp Westerbork gives notice by telephone, that since four o’clock this morning the Jew Eduard Van de Rhoer, born in Meppel 17.07.08, Dutch, single, textile agent, formerly living in Meppel, at 6 Stationsweg , has been missing from Camp Westerbork. Van de Rhoer was going to be transported this morning and made use of the fog to escape. He has been in Camp Westerbork since 18.08.1942. Description: length 1.65-1.70, stocky build, round face, pale complexion, blond hair, somewhat bald headed without beard or moustache. Clothing unknown. Speaks refined Dutch and fluent German. He has no identity papers. Apprehension and appearance in court is requested. Two years of hiding in and around Meppel followed. Finally the two brothers enjoyed the liberation on the farm of the Rijkeboer family on Steenwijkerstraatweg. Jacob and Eduard could start a new life. They married respectively Emmy Benima and Helene Seelig and left Meppel. Eduard van de Rhoer and Helene Seelig married in the town hall in Meppel soon after the war. 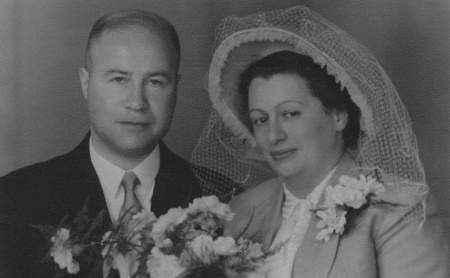 Jacob van de Rhoer and his wife Emmy Benima. Jacob went to Israel and became a member of the judiciary. Eduard went to live in Brabant and went into the textile trade. Jacob had no children, Eduard had two sons: Jacob and Joël.